Format corrupted Innostor flash controllers that have chip part number Innostor IS916-B1, IS916-C1, IS916-D0, IS916-D1.Download Innostor IS916 MP Tool v2.10.02.49 firmware and fix your flash disk . Innostor IS916 MP Tool v2.10.02.49 has been designed to reformat Innostor Flash controllers .Innostor IS916 MP Tool v2.10.02.49 format tool support updating the flash controller firmware of the following Innostor chip vendor : Innostor IS916-B1, IS916-C1, IS916-D0, IS916-D1 .Innostor IS916 MP Tool v2.10.02.49 formatter can fix Innostor flash drives format errors such as raw flash disk ,write protection ,insert disk error message , no media and other format problems . Innostor IS916 MP Tool v2.10.02.49 firmware support repairing the previous chip controllers , so please don't use it with different controllers .First determine your USB flash disk chip vendor , you can use Chip genius software or USB Deview V2.30 utility. How to update Innostor IS916 flash drive firmware ? Download Innostor IS916 MP Tool v2.10.02.49.rar from download links below . 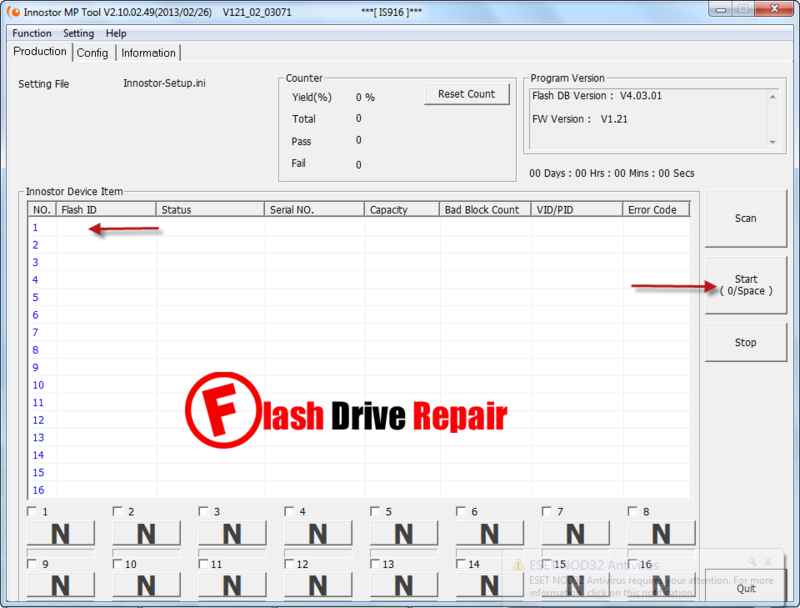 Insert corrupted Innostor IS916 flash disk to your PC . Extract Innostor IS916 MP Tool v2.10.02.49.rar and open Innostor IS916 MP Tool v2.10.02.49.exe . If your flash controller is supported , you will see flash info appears on the software interface . Click Start to update flash controller firmware . If you need to change configuration " Config Password : IS0024 " . I'm Nathanael and i've got a lexar 32GB flash drive that isn't working properly the numbers on the chip are: PF47, AL, 1242, and RRYG. I've run it through ChipGenius and also Innostor IS916 MP Tool and i can send screen shots of the outcome if it helps. how to flip the removable bit with this tool? Hello, i had try this tool and i can find my usb stick, but it fails because config fail. I had also tried with the both external configfiles. Drive could not be repaired. Controller Part-Number: IS916-B0 - ??ROM?? download link is not working .please fix it. D27UCG8T2MYR Innostor Flash drive MP tool.